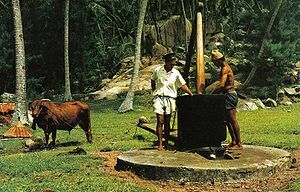 So I’ve been hearing about Coconut Oil, once considered highly unhealthy, being re-evaluated from a health standpoint. Coconut Oil has been getting a fair amount of buzz this past year. I had read an interesting piece in the NY Times by Melissa Clark about cooking with it. 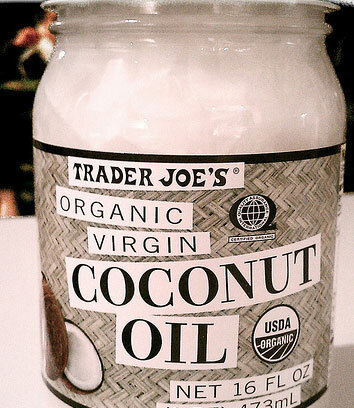 I saw this jar of Trader Joe’s Organic Virgin Coconut Oil in the NEW PRODUCTS shelf at my Trader Joe’s. I thought, I should see what all this is about and made a mental note to pick up a bottle and try it. Its an interesting product as it has uses both ‘Culinary’ and ‘Health & Beauty’ Or as I think of it – its skin cream you can eat! Or Cooking Oil you can use as Hair Dressing. No really, its good for all these things. In fact, it has so many uses! When I opened the bottle and sniffed it, it was just amazing…WOW! It has an intense smell of COCONUT. I mean you smell it and your mind instantly thinks ‘Tropical Beach’. Just smells yummy and wonderful. I heard it was great in cooking especially good for sauteeing vegetables, as Melissa Clark wrote about. So I peeled and sliced up some Carrots (TJ Organic Carrots) and tossed them in a pan with about a tablespoon of the Coconut Oil. Again, an amazing smell wafted through the kitchen. Tossed in the sliced carrots and let them sauté for about 10 minutes or so. After the carrots were slightly browned I tasted one. It had a wonderful under-note of (yes) Coconut. The sauteed carrots tasted delicious, and I could imagine many vegetables benefitting from being cooked in coconut oil. Melissa Clark mentions roasted sweet potatoes – that sounds great – and she has a number of interesting recipes listed in her piece, which you can try. 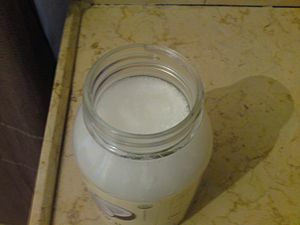 Coconut Oil when it’s kept at a cool temperature appears white and in a solid state. If it warms up it, will become clear and liquid. Additionally of course this is good for other things, like putting on your hair too. And it is wonderful to rub on dry skin as a moisurizer. I even read its a natural antiperspirant (you put a drop or two under your arms). What a useful product. The question may be Where to keep the jar?! In the Bathroom or the Kitchen?!! A jar costs $5.99 for 16 ounces. Check it out. I’m just beginning to experiment with using it. And yes, it truly makes your hair beautiful and smell wonderful too.